Yesterday was a big day for us and for the school project. The container was due to arrive at 9.00 pm on Friday and the team of packers were allocated three hours to get everything we had collected over the last year or so from a range of group and individual donors aboard. 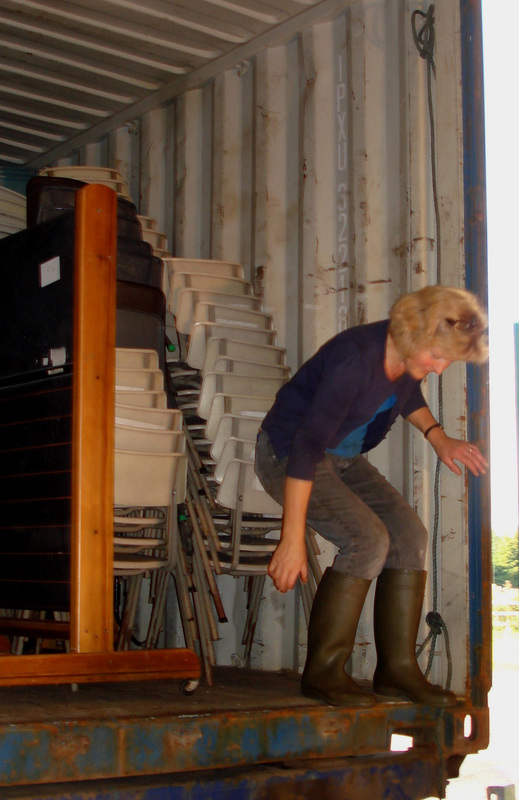 Recently Louise had tried to visualise how much space there would be in the container and became slightly concerned that we might not have enough to properly fill it, realising that it would be best to have it really tightly packed so that the goods inside would not move about in transit. That was when she contacted Peter Goldie from Dundee Waste Management who was able to donate some goods and also put us in touch with Doug McLaren of Tayside Recyclers in Dundee. Doug took us on a tour of the Emporium and we were amazed at the amount and quality of the furniture stored there. Once we had explained our school project to Doug he immediately took us on a tour of all stores rooms over two buildings and offered to fill a van with whatever we decided we be useful for the school, at no cost to us. We set about choosing 3 free standing blackboards, 2 white boards, desks, storage units, library shelves, 20 excellent reconditioned computers and 2 laptops originally from Dundee College, an old fashioned Singer sewing machine with a treadle and a TV with video etc. 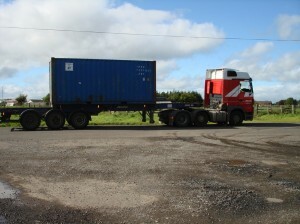 We also noted in passing things we might send in a future consignment if this container gets through successfully and Tayside Recyclers have said they would again help us to fill it with whatever we required for the school. 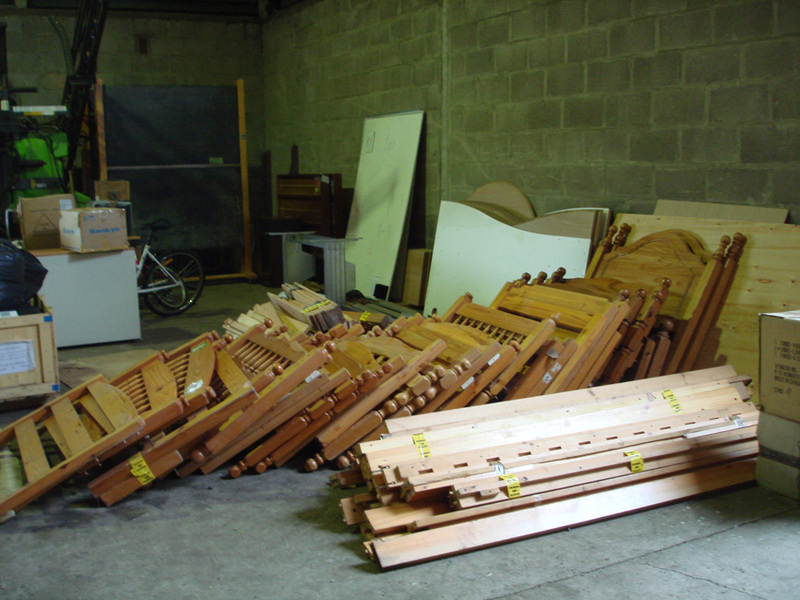 On Thursday morning the hired van arrived at the Recyclers Emporium but it was too small to take the blackboards, so it was decided to use their own larger van for the bigger items and send two van loads to the farm at Carronshore where the other goods have been stored for a long time now. Later in the morning Louise got a phone call from Doug to say the hired van was only half full and to ask should they load the dismantled bunk beds for the dormitories that we had looked at and thought might go on a future load? Louise said yes but wondered at the time if the beds would be too bulky to find room on the container. The two very full vans safely arrived at Roughlands Farm around midday and were unpacked ready for the following morning. As Alice and Louise walked around noting things down for the inventory, they were delighted to see that two very good bicycles had also found their way onto one of the vans. We really can’t thank the guys in Dundee enough for all their work and generosity in giving us all these goods for the school. It will make such a difference in Tanzania since most of these items are not available locally even if the school had the money to buy them. The modular classroom furniture which matches the tables already received from Drymen Primary School and free standing blackboards will allow the children to be taught in groups, using modern methods. The wide range of books (many donated by Duncan of Jordanstone library) will be useful to the teachers as well as providing suitable reading material for the children. We have also included bags full of donated linen; towels, sheets, pillow cases and curtain material for the dormitories donated by our friends. A local seamstress or tailor will be employed to adapt the linen, make curtains for the dormitory as well as making school uniforms for the children using the sewing machine donated by Tayside Recyclers. 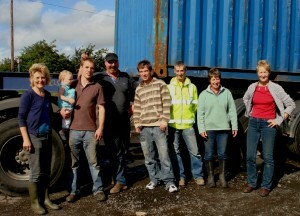 Early on Friday morning the packing team assembled, they were; Wilma Johnson and her son Robert, Louise, Alice and her son Gordon, Craig who drove the fork lift all of us supported by Wilma’s daughter Emily who supplied regular coffee breaks and lunch for the workers. Barry the driver of the container lorry also got involved helping with the packing. While all the stuff was finding its way onto the lorry Louise’s task was to check the inventory and track which furniture boxes of books, bags of clothes and linen got onto the container. 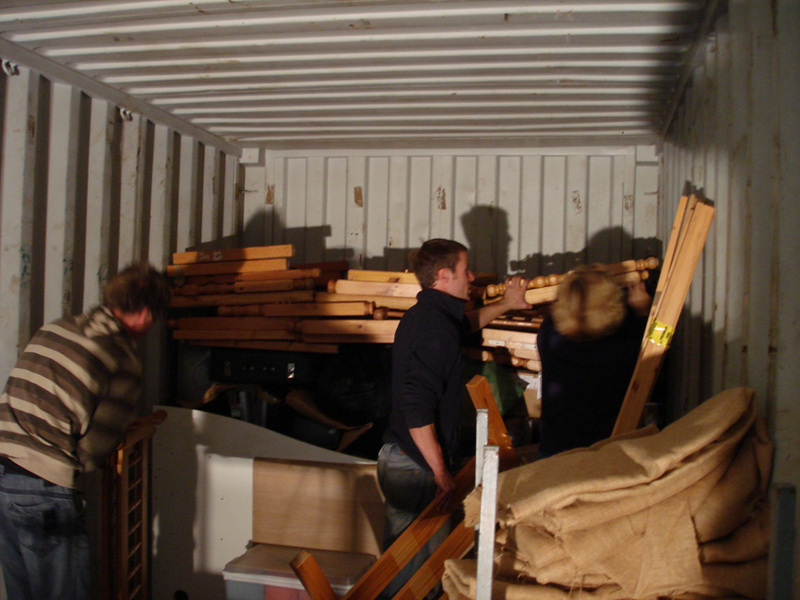 A system quickly developed and the team organised itself with Wilma and Robert taking over the packing inside the container with help from Gordon. Meanwhile Alice and Craig used the fork lift with bucket attached to transfer all the goods from the store to the barn where the container was parked. Louise kept the inventory up to date and prioritise which items were going on first (mostly computers protected by desks), carefully packed as the most valuable goods. With a short coffee and bun break and another break for lunch we reckon it took just over four hours to pack – a testament to excellent teamwork and the energy of all concerned – particularly Wilma and Robert who had to think on their feet while arranging at times very heavy boxes around the space in order to find the most efficient way of packing a huge range of odd shaped objects and boxes. One of the most dangerous things was climbing in and out of the container which stands about six feet off the ground and has no helpful hand grips. It was very dark inside the container so we set up a powerful halogen light and directed it into the back so that we could see what we were doing. About half way through the process it became apparent that since we were packing right up to the roof, we were going to get absolutely everything in with only a little room to spare. Towards the end we put on a few extra monitors and a couple of TVs and found room for another bike, which although it needs new tyres, is otherwise sound. 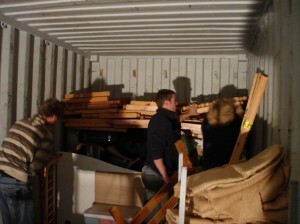 With a great deal of satisfaction we closed the doors on a very full container. 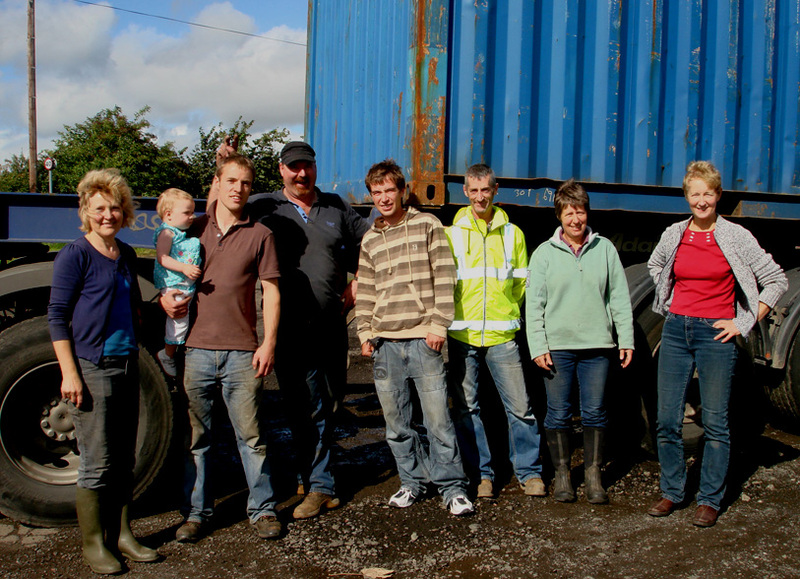 When Barry first arrived at the farm the container we looked at it and thought it is too small, we will never get everything in and as it drove away suddenly the container looked very small again. Our container is now sitting at the docks at Grangemouth where it will be fumigated before being shipped to Dar es Salaam on the 1st October to arrive in Dar es Salaam on the 4th November. The fumigation is a necessary step to get it through customs and will mean setting off a canister of gas and then waiting for 12 days to release the pressure. Once it has finally reached Dar we have a clearing acompany called Teddy.co to steer it through customs and then it will be transported to the school project by a company in Tanzania chosen by Baraka and Ntimba. If all goes well then the container with all these donated goods will be at Namanditi early in November.